Riprap, also known as rip rap, rip-rap, shot rock, rock armour or rubble, is rock or other material used to armor shorelines, streambeds, bridge abutments, pilings and other shoreline structures against scour and water or ice erosion. These are the typical uses for riprap, but other uses are on a steep graded hill to prevent weather related erosion. One benefit to riprap that might be overlooked is that it helps increase habitat for wildlife, specifically small creatures looking for shelter during wet weather. • Use a well-graded mixture of rock sizes instead of one uniform size for graduation. • For the quality of the stone, use riprap material that is durable so that freeze and thaw cycles do not decompose it in a short time; most igneous stones, such as granite, have suitable durability. • In regards to riprap depth, make the riprap layer at least two times as thick as the maximum stone diameter. • Apply a filter material–usually a synthetic cloth or a layer of gravel–before applying the riprap. This prevents the underlying soil from moving through the riprap. • There are riprap limits. Place riprap so it extends to the maximum flow depth, or to a point where vegetation will be satisfactory to control erosion. • Ensure that riprap extends to five times the bottom width upstream and downstream of the beginning and ending of the curve and the entire curved section. • The size of the riprap material depends on the shear stress of the flows the riprap will be subject to, but it ranges from an average size of 2 inches to 24 inches in diameter (Idaho Department of Environmental Quality, no date). • Riprap will require an enclosure. Consider using chain link fencing or wire mesh to secure riprap installations, especially on steep slopes or in high flow areas. The steepness of the slope limits the applicability of riprap, because slopes greater than 2:1 can cause riprap loss due to erosion and sliding. Inspect riprap areas annually and after major storms. If riprap has been damaged, repair it promptly to prevent a progressive failure. If repairs are needed repeatedly at a location, evaluate the site to determine if the original design conditions have changed. Also, you might need to control weed and brush growth in some locations. When properly designed and installed, riprap can prevent erosion from the protected area. There are various sizes of riprap and which one you use depends on what you need it for. Smaller riprap stones are ideal for a driveway or gravel parking lot. They’re durable enough to withstand wear but aren’t too bumpy. This size is also beneficial near ditches to keep soil from eroding and aiding in weed control. Other uses are walking trails and around the base of a tree. Medium size riprap stones are great along shores of lakes, rivers and streams since they are somewhat hard to walk on, therefore they can be used as a deterrence for people. Other uses are for retaining walls, along railroad tracks or gravel roads used by the public. 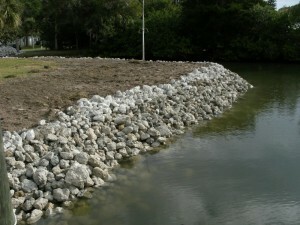 This is the largest riprap stone size and ideal for areas where a lot of erosion may occur. Areas where this size is used are in large ditches or to restore banks that have already been slightly eroded. The cost of riprap varies depending on location and the type of material selected. A cost of $35 to $50 per square yard of nongrouted riprap has been reported, while grouted riprap ranges from $45 to $60 per square yard (1993 dollars; Mayo et al., 1993).